Sister Ruby Records was an Atlanta label from the early 1990's, loosely associated with the late great Eat More Records store (RIP Craig Freireich). The label focused on local artists, and issued three Christmas comps that still find their way into my CD player every year. Participants who went on to greater success include Shawn Mullins, Michelle Malone, Kelly Hogan (a lovely "Rockin Around The Christmas Tree" with the late Gregory Dean Smalley on guitar), the late Benjamin Smoke (aka Opal Foxx), and a blowsy combo from the far side of Lake Hartwell who were about to make the #1 album of 1995. If you knew the ATL scene in the 80's and 90's, you will recognize veterans like Amy Pike, Anne Richmond Boston, Kristen Hall, Ray Dafrico, Tommy Rivers, and several folks who arose phoenix-like from the crack pipe crucible of The Coolies. You may remember bands like Big Fish Ensemble, The Vidalias, Engine, and The Doll Squad. There are fine versions of Christmas tunes written by Mel Torme, José Feliciano, Buck Owens, Pete Townshend, Greg Lake, Steve Earle, The Ramones, Alex Chilton, Yoko Ono, John Lennon, and Joni Mitchell; the Heat Miser/Snow Miser song; and (my favorite) Uncle Green's "Have Yourself A Merry Little Christmas", with a lovely little segue into "Space Oddity". Here they are -- olden, golden, and emboldened to tackle these holiday chestnuts, as well as creating a few original Christmas songs. Thanks jonder...a good year...I listed you near the top of the thank yous on my last post this year up now. Cheers! I am happy to have you all as readers and friends. In the words of Peewee Herman, Feliz Na-bla-bla! 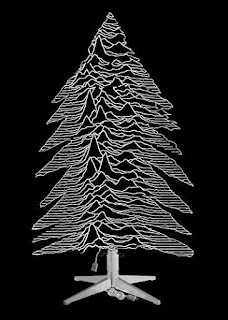 Joy Divison tree ... or what ? 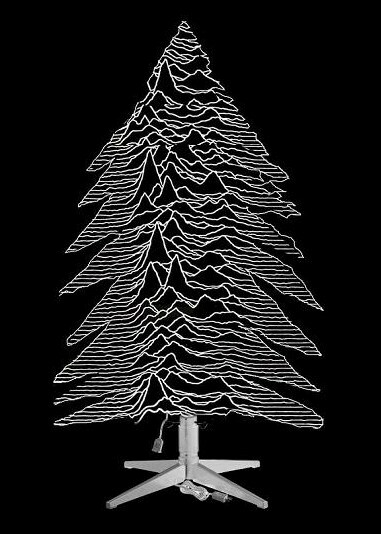 Well spotted: you win a pair of Joy Division oven gloves! But how do I know that you're the same Anonymous? Hey, that's a youtube video (not what I expected). I am the the same @nonymous, don"t worry. We know us from Twilightzone ... I want to have the oven gloves. Man, sarcasm can get you into deep doo-doo.